George Bailey was born in Cleveland in 1902. His parents moved to Detroit in 1908. George had three brothers William, Clifford and Harold. He was not married. George got a job as a test driver for the Hudson Motor Co. This would eventually lead to his competing in the Indy 500. 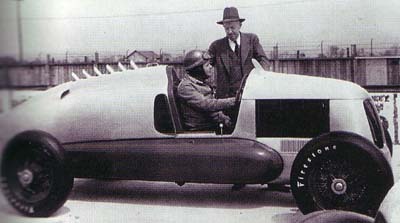 In his first 500 in 1934, Bailey flew over the wall on lap 12 and was slighty injured. He raced in five 500's altogether, but never finished a race. 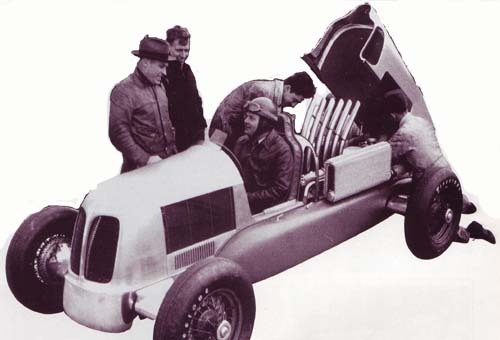 In 1939, Bailey made history by qualifying the first rear-engined car in the Indy 500! He qualified the expensive Gulf-Miller on the 2nd row. This car, as shown in the photos below, was ahead of its time. It featured pannier fuel tanks, four-wheel drive and disc brakes on all four wheels. The engine would throw a valve on lap 18. 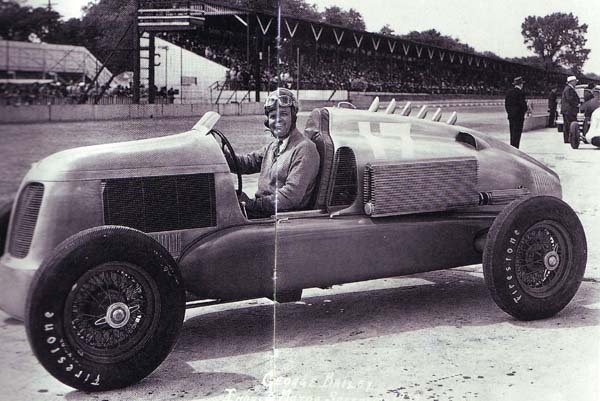 In 1940, Bailey brought the same four-wheel drive car back to Indy. On May 7th Bailey was out practicing. He ran 15 laps and came in to the pits. He went back out and by lap 4 was up to 128.5 mph. However, as Bailey entered turn two, either he got up into the marbles or maybe his crankshaft broke, freezing all four wheels. In any case, the car started to slide sideways and as he fought to bring it back into line, it shot into the inside rail. A rail punctured his left side fuel tank causing it to explode. The car spun and the right side fuel tank got hit and exploded. Bailey was drenched in gas! As the car came to a stop, Bailey jumped out on fire and ran. He fell at least three times before he was reached by Eddie Hoff, a speedway photographer, who tried his best to beat out the flames. Bailey died 45 minutes later from third degree burns. He had also suffered a fractured hip and injured leg.